Dr. Kim Waaso, D.O., FACEP, Kingwood Emergency Hospital physician, was honored at FamilyTime Crisis and Counseling Center’s Hearts of Gold Gala on Saturday, January 26, 2019. She was recognized as FamilyTime’s 2018 Woman of Achievement in the Medical category. Since 1990, FamilyTime has served local families in crisis situations. Each year the Center recognizes women in the community who have made a difference. Dr. Waaso began her medical career as a registered nurse and utilized her nursing foundation to launch a successful career in medicine. After attending medical school, she completed a residency in Emergency Medicine at Michigan State University and has been practicing emergency medicine for 17 years. For the last 12 years she has served with distinction as Medical Director for Atascocita Fire and EMS. She developed the first Medical Rehab Team (MURC) for the State of Texas dedicated solely to the treatment of first responders at disaster scenes. Her team’s first deployment was during Hurricane Harvey and was regarded by the State of Texas to be a tremendous asset. As a result, the MURC’s have become a permanent unit for the State during all disasters. Dr. Waaso was named Medical Director for one of the state’s 14 special AMBUS units that are placed strategically around Texas for disaster deployment. This unit deploys not only to disasters in Texas but also our neighboring states. 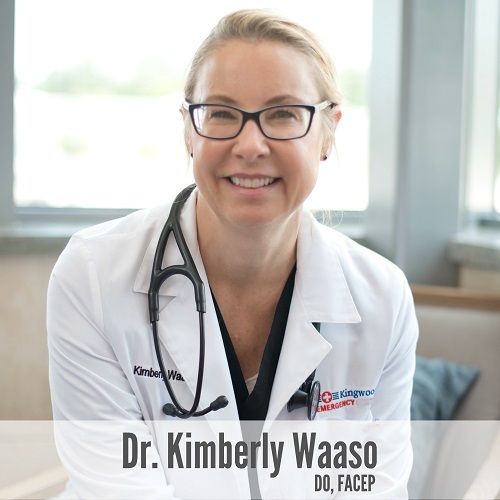 As a Board-Certified Emergency Medicine physician, Dr. Waaso provides outstanding care at Kingwood Emergency Hospital. Kingwood Emergency Hospital is proud to have Dr. Waaso as part of their caring and committed physician team and congratulates her on this achievement award.